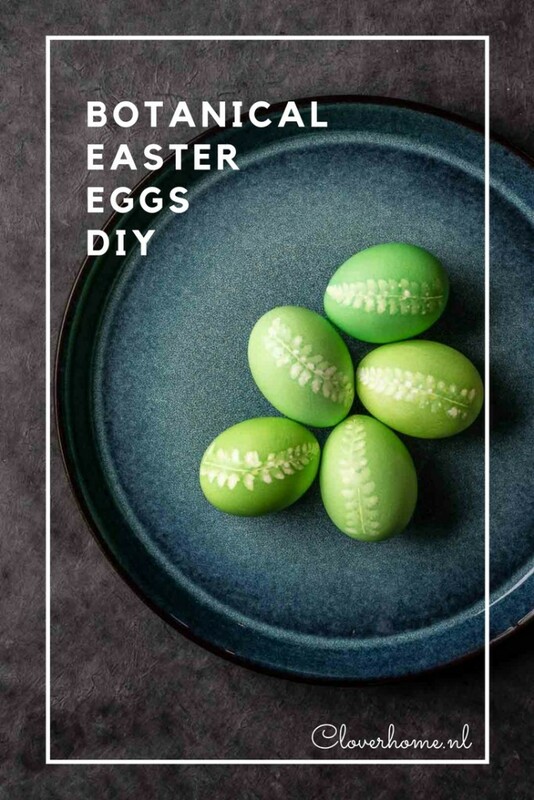 I love decorating eggs for Easter and there are still so many ideas I would like to try. Just as with last year’s delicate egg vases, I kept it really simple. 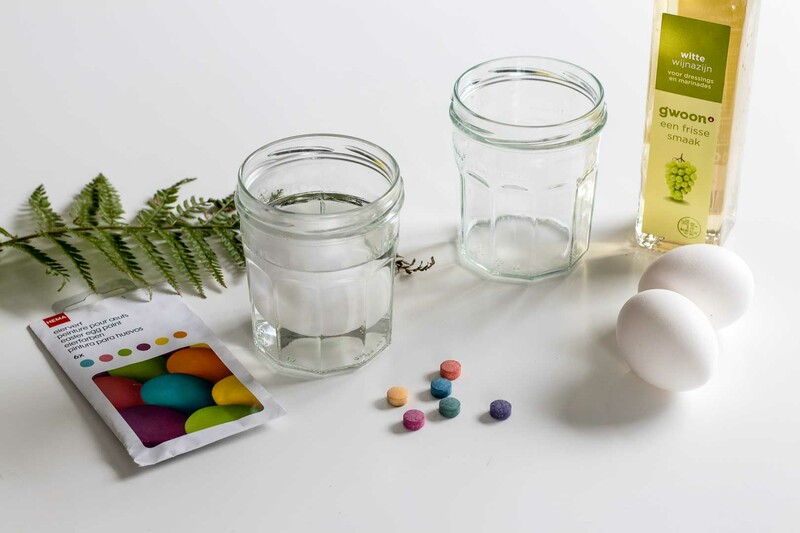 All you need are eggs, a simple Easter egg kit and some ingredients from the garden. It’s an easy and affordable project! Begin by washing your eggs. You can use hard-boiled eggs or blown out eggs. If you want to eat your eggs when you’re done, use hard-boiled eggs (store them in the refrigerator). If you want to keep your eggs for a longer time, use empty eggs. 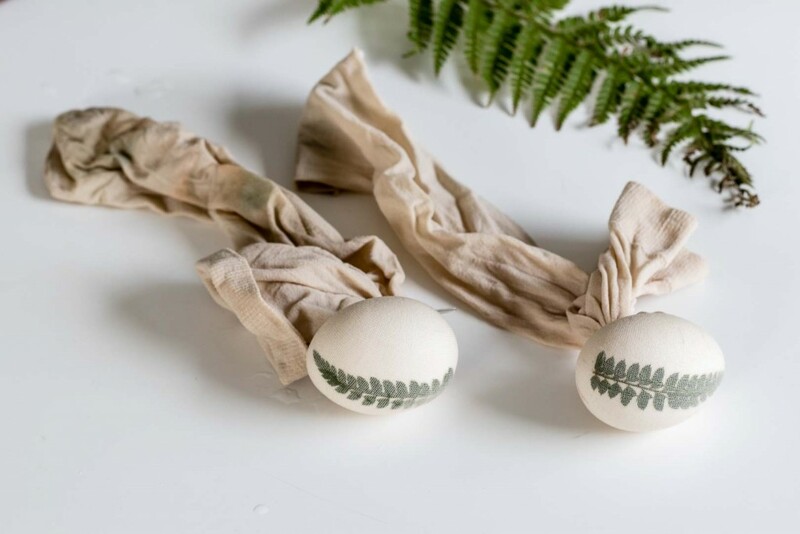 Read my DIY pressed flower Easter eggs to find out how to blow out eggs. Step into the garden and gather the leaves or flowers you plan to use for this project. I used fern leaves but I can imagine dried hydrangea flowers will look good too. 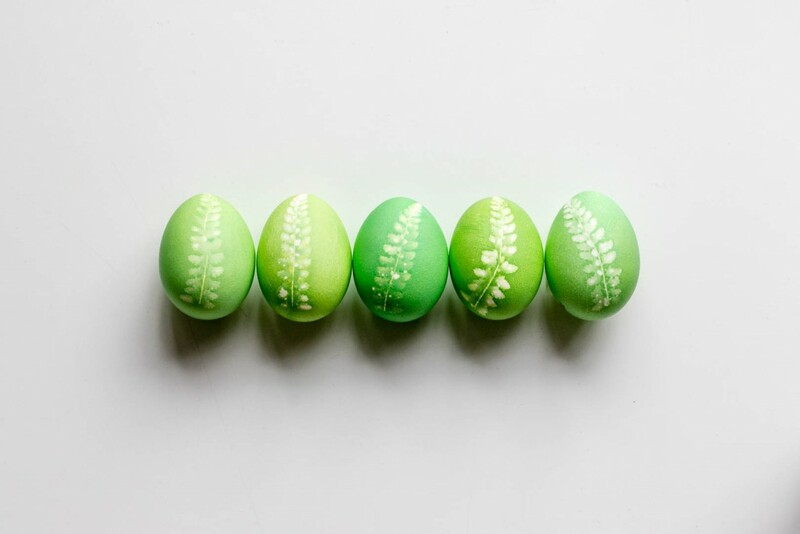 Cut the fern leaf into small egg-sized pieces to use as an imprint. I used an egg-dyeing kit consisting of 6 dye tablets and a wire dipper. For this project, I only used the yellow and green tablet. Put the dye tablets in the glasses. 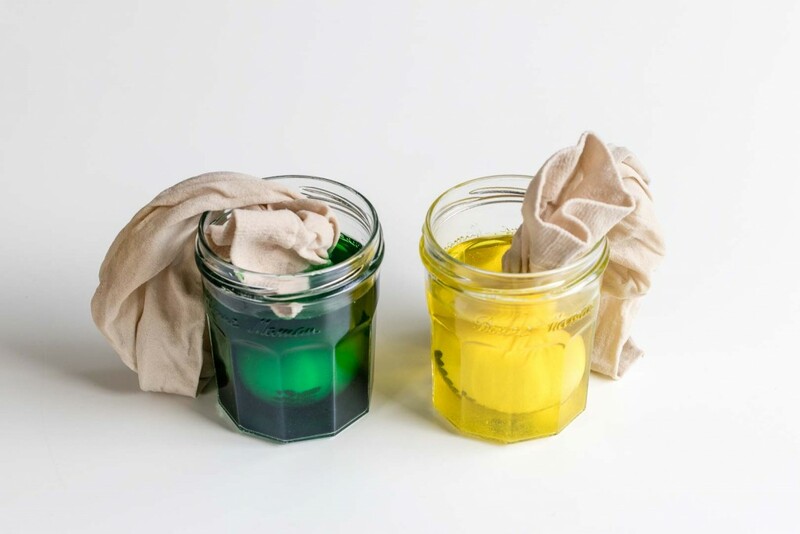 Add two tablespoons of vinegar to each glass and just enough hot water that allows you to submerge the entire egg. Or prepare your dyes according to the instructions on the packet. A lot of Easter egg DIY’s use natural ingredients to colour the eggs, like red cabbage, onions, blueberries, and even grapes. And of course, this is a wonderful idea. But blueberries, in March?! They are really expensive, flown in from South Africa. And a red cabbage can feed a family of 6. So for now, I’ll just stick to my dye tablets. Wet the eggs and leaves with a bit of water and place the fern leaf on the egg. The water helps the leaves hold still while you tie everything up with the pantyhose. Pull the pantyhose tight against the egg, twisting it securely at the back. Fasten with a twist tie. Then, submerge the covered egg into the glass. The longer they are left in the dye, the darker the colour. 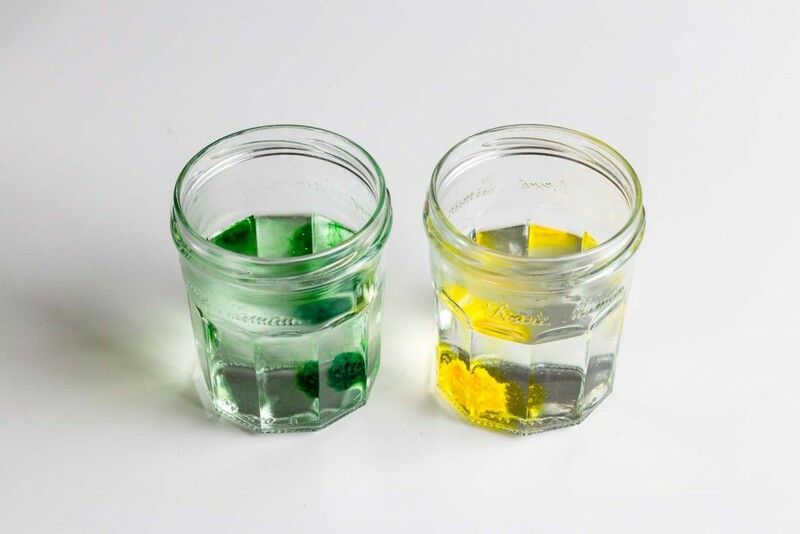 To create different shades of green, transfer the eggs from one glass to another. Let them dry for a minute on an oven rack. Carefully remove the twist tie, pantyhose and leaves and let them dry completely. 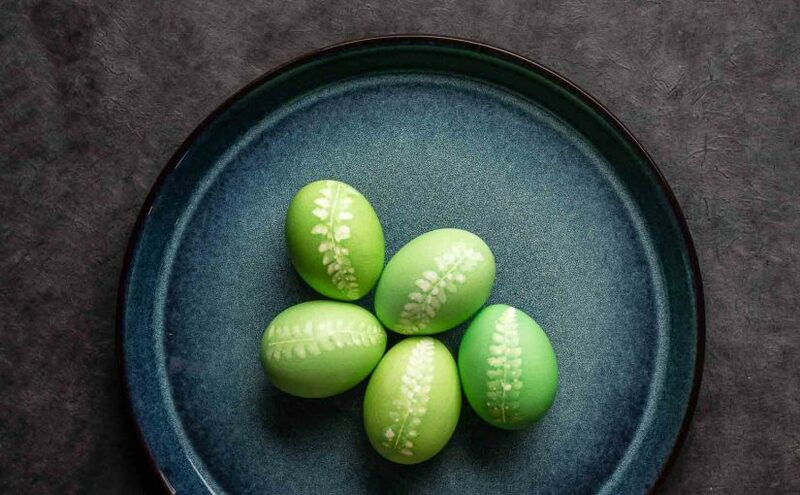 Admire your botanical Easter eggs! Thank you so much, Tina! Have fun dyeing your eggs, let me know how they turned out.